The latest version available is FFmpeg 2.3.3 “Mandelbrot, which has been released a while ago, coming with updates for the library components: libavutil 52. 92.100, libavcodec 55. 69.100, libavformat 55. 48.100, libavdevice 55. 13.102, libavfilter 4. 11.100, libavresample 1. 3. 0, libswscale 2. 6.100, libswresample 0. 19.100 and libpostproc 52. 3.100. 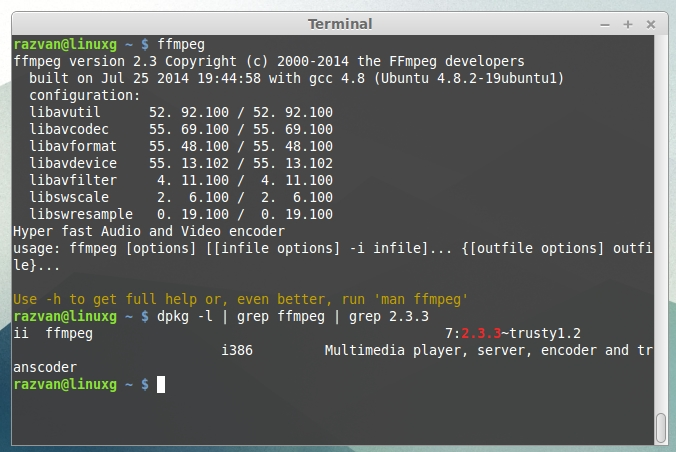 In this article I will show you how to install FFmpeg 2.3.3 “Mandelbrot” on Ubuntu 14.04 Trusty Tahr, Linux Mint 17 Qiana, Pinguy OS 14.04, LXLE 14.04, Elementary OS 0.3 Freya, Peppermint Five, Deepin 2014, Linux Lite 2.0 and other Ubuntu 14.04 derivative systems. thank you, it result useful to me.